And you thought cats hated water? Most cats hate water. This cat has no problem with it. Or with anything else either! Odin the tiger goes where he wants to, including the water! Swimming like a cat? Yes! 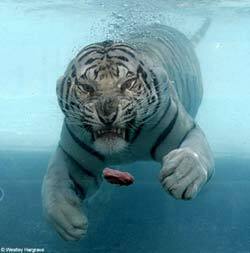 Swimming like a BIG cat! Most cats do not like getting wet – as anyone who has tried to bathe a moggie will know. But as these pictures show, there’s always the exception to the rule. For the cat in question is a large male white Bengal tiger called Odin. Six years old, and at the prime of his life, Odin lives at the Six Flags Discovery Kingdom Zoo in Vallejo, near San Francisco. He is about 10ft long from nose to tail, and is an excellent swimmer.